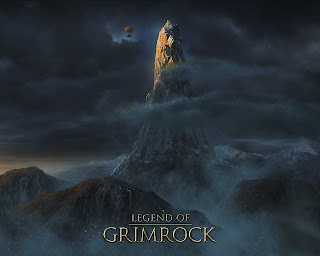 The Legend of Grimrock is a very good game. There are lots of reviews lauding the lighting and graphics, easy user-friendly game-play, devilish puzzles that make you feel dumb and then brilliant simultaneously. I personally am a fan of secrets you must actually locate, versus them being detected based on a skill. Let me highlight one brilliant example of the gameplay. Like Dungeon Master and Eye of the Beholder, The Legend of Grimrock has real-time combat. A common tactic in this type of combat is to pull an enemy into a 10' by 10' room and move to their side. Then when they walk in front of you, strike them and move to the side again. Rather then ignore this, the developers created opponents such as the crab. So those carefully honed skills you've developed are thrown out the window as you have to relearn which direction your opponents is going to move. Then you're thrown for another loop as you discover they can walk forwards too. Just a quick rundown to cover the bases. There's a Dungeon Selector on the title screen! Magic is cast using a rune system. You spent more than 10$ on pizza this month. Go get the game now! Bought it yesterday... no idea when I'll find time to play it, though. I fell in love with this game the moment I saw a trailer playing on someone else's monitor from across the room. Pre-ordering it was a marvelous decision. I'm a slow player, though. While many are on their second or third play-through, I'm still working my way through the second level of the dungeon. I'm only able to manage a few hours a week for video games these days. Still, it has been exhilarating to actually play a game where I get to create the map myself again.